Here at Greene, we want to share with you the very best information, tools, software and systems that will help you grow your wealth and protect your assets. Everything that we recommend on this page we have firsthand experience with. “You Need A Budget” is the absolute easiest, most fun way to lift yourself out of debt (or keep yourself from getting into debt) by directing where you want every one of your dollars to go. This is why Greene highly recommends YNAB. On average, new users save $200 in their first month and more than $3,300 by month nine. You can get started with a free trial and because we introduced you to YNAB, rather than a 34-day trial, you get a FULL 2 MONTH FREE TRIAL! 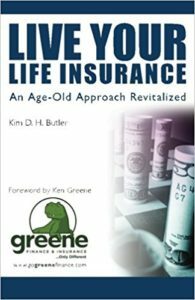 “Live Your Life Insurance” nicely lays out the fundamentals of whole life insurance and how it can be such a powerful financial vehicle (if designed correctly) to store cash and have control, liquidity, use, and equity. In it, you’ll discover exactly how you can use your life insurance to benefit you while you are alive, and help you build financial security. Get this powerful read right here. Get financial info in your inbox!